Large weevil invading the north-west? Leaving windows and doors open has helped cool the house during the unusually hot spell we have been enjoying. However, that does mean that the outside can readily find its way inside, as was the case with this large beetle, which appeared in my utility room on 2nd June 2018. The snout or rostrum on the front of its head, bearing angled antennae near the end, identifies it as a weevil. At about 13mm long it must be one of the largest British members of that group, and its size and pattern allow it to be confidently named as the pine weevil Hylobius abietis (some 613 species of weevils occur in the British Isles). Its larvae occur in the stumps of pines, spruces and other conifers and the adults feed on their needles and other plants. As a result, it is not a great favourite amongst foresters, being described as a ‘notorious, troublesome and intractable pest, particularly of regeneration forestry’. 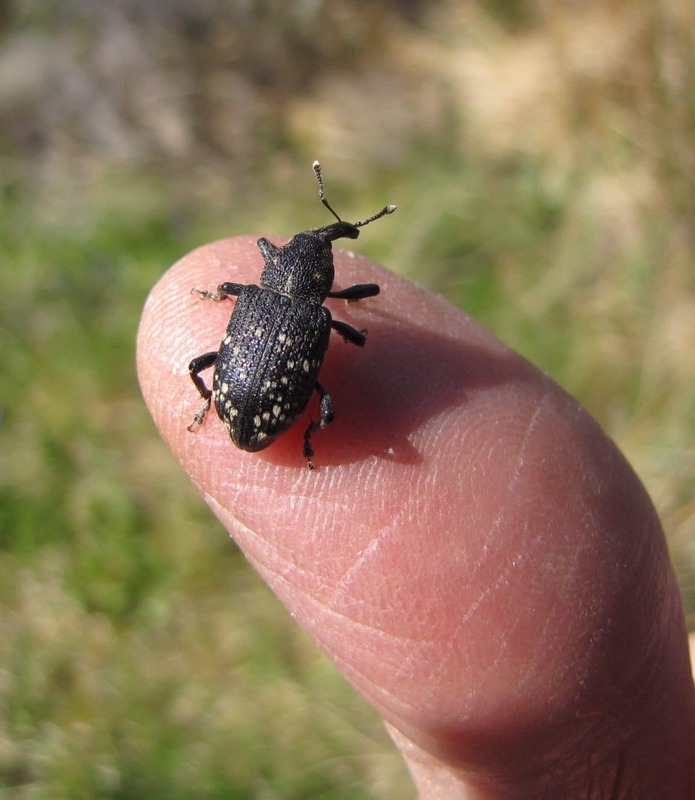 Mike Morris, the national expert on weevils, with whom I was at university, said in the definitive work on this group, published in 2002, that it was at that time ‘not recorded north of West Ross’. However, the late Non Macleod found one at Drumbeg (NC1232) on 14thMay 1999, I had another at Nedd (NC1331) on 15thMay 2000, and I saw one on the road to Loch a’Mhuilinn (NC0243) on 23rdMay of this year. It would appear to have established a beachhead in West Sutherland, perhaps under the influence of global warming?